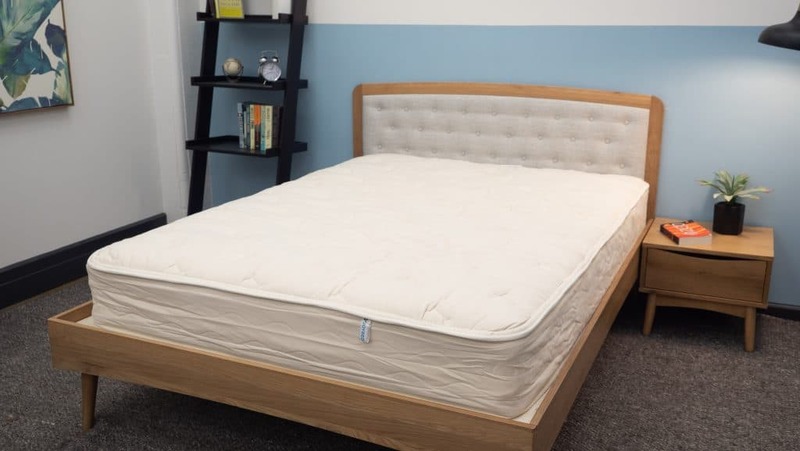 Joybed Mattress Review - Organic Materials for Natural Sleep? I’m naturally ecstatic for this review, as I’ll be diving into the LXC All-Cotton mattress from all-natural bedding brand Joybed. Designed to be completely renewable, biodegradable, and recyclable, this bed’s eco-friendly combo of organic fibers and non-toxic materials seem likely to provide a satisfying sleeping experience that will help you (and your conscience) sleep easy. But do all those natural, oh-so-sustainable materials really make for a comfy mattress? I won’t know until I put this bed through my series of rigorous Sleepopolis tests, which should not only tell me if this bed is as cool as it claims, but whether or not it could be the bed of your dreams. Continue reading below for my full review of the Joybed mattress. Don’t have time to read it all? No problem! Click here to skip to the bottom and check out my review summary. The Joybed is a hybrid mattress that uses natural materials in place of foams. The comfort of the Joybed is provided by a mixture of organic cotton and wool, so if you're looking for a firm mattress with natural fibers, this could be the choice for you! Joybed was founded in Grand Rapids, Michigan in 1889. For the last century, the company has taken a very vocal position on foam: namely, they can’t stand the stuff. 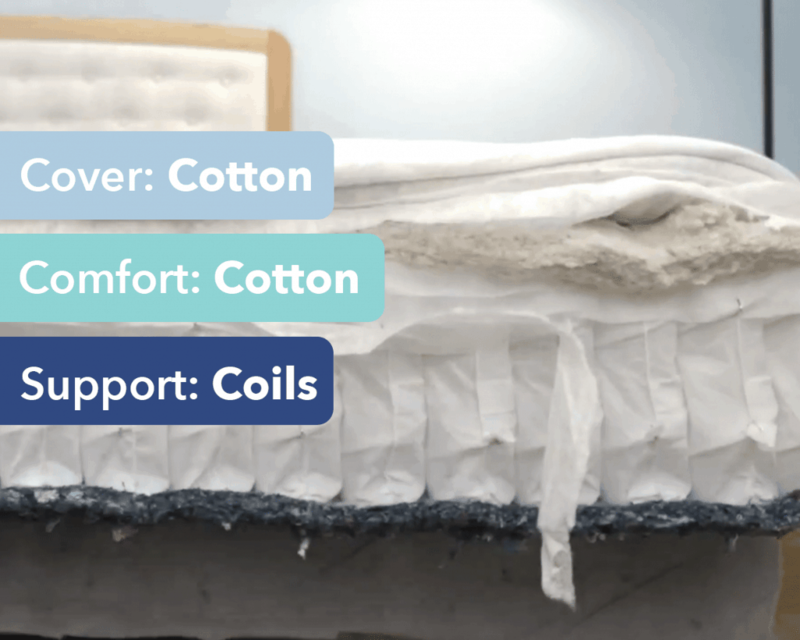 As the Joybed website proclaims, “We know foam is wrong.” Instead of foam, the company uses all-natural cotton, and plant fibers to build each mattress from scratch, without any synthetic or toxic materials. Embedded in this environmental stance is the brand’s other main argument: natural materials, according to Joybed, sleep cooler and drier than foam — which means the Joybed mattress could (theoretically) help us sleep better than a synthetic competitor. But staying cool and dry is only one component of a good night’s sleep, so we’ll be putting this claim to the test later on in this review. For now, though, let’s dive in and check out the bed’s construction. To breathe or not to breathe, that is the question! Or at least, that’s the question when it comes to most foam mattresses. By far the most popular mattress material, polyurethane foam is also the least breathable: it’s made from petroleum, mixed with chemicals, and lacks surface texture. The Joybed mattress, measuring a full 12 inches in height, is constructed completely sans foam, opting instead for cotton layer enclosed in a fabric of woven plant fibers, all of which breathe easily. To see how all these earthy materials come together, let’s explore this mattress layer by layer. Cover – The cover, constructed of 100% brushed organic cotton, will provide you some immediate cooling relief and initial softness. Adding extra breathability, the cotton is quilted in a natural fabric made from plant fibers, including stems and leaves from common farm crops like beans and potatoes. Comfort Layer – Moving down to the comfort layer, you’ll find another thin layer of cotton which lends some gentle cushioning and sinkage, so you can think of this layer as the all-natural counterpart to the foam comfort layer found in most synthetic beds. Support Layer – A buoyant support layer of pocketed coils closes out the bed’s construction, giving the bed its firmness, structural support, and much of its overall feel. Since the comfort layer above is relatively thin, the firmness of the coils can be felt throughout the mattress, and the all-coil composition of this layer gives the bed its signature bounce. Now that we’ve scoped out the bed’s construction layer by layer, let’s talk about how those layers combine to give this bed its unique feel and firmness. For a first impression, I stretched out on my back. Right away I noticed the bed’s firmer feel, with my weight evenly distributed across the bed’s bouncy top layer. The cotton in the comfort layer condensed just slightly, providing minimal contouring along my lower back. Rather than rely solely on my own opinion of the bed, I rounded up three other sleepers to help me test out the bed’s firmness and feel. I then compiled all of our ratings onto the graph below. Firmness is a personal thing, of course, depending on body shape, size and individual preference. You might not find the bed as firm as we did, but with any luck our combined assessments will help to give you a broad idea of what to expect with this mattress. As you can see from the graph, my testers agreed on the firmness of this mattress, giving it a combined average firmness rating of 7.5. 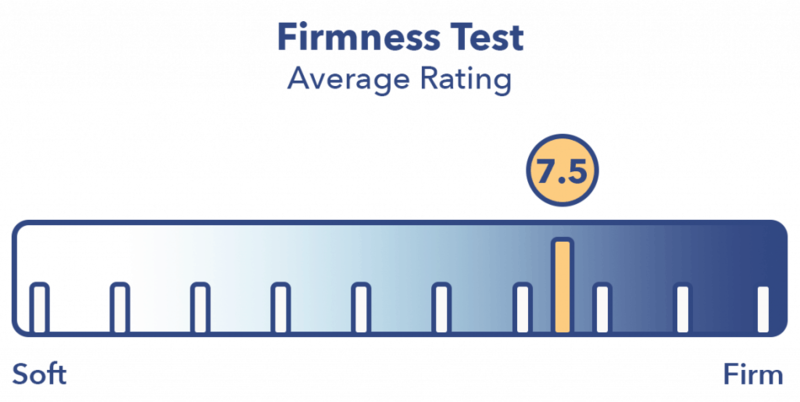 For perspective, the industry standard for medium firmness is 6.5. 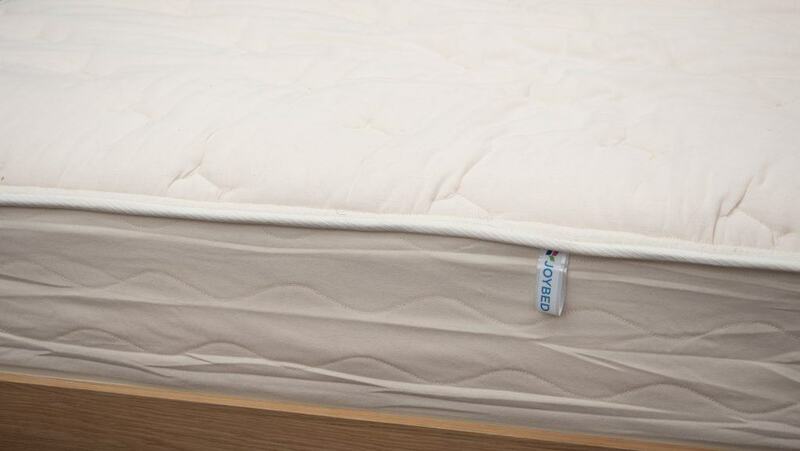 Clocking in a full point above medium firmness, it’s clear that this Joybed mattress is very firm. I personally gave the bed a 7.5, as I found its combination of pocketed coils and thin comfort layer of cotton created a super firm feel. For me, this means I didn’t experience a ton of pressure relief as I rolled around the bed, nor did I experience a lot of sinkage or give. I felt lifted, but not cradled or contoured. 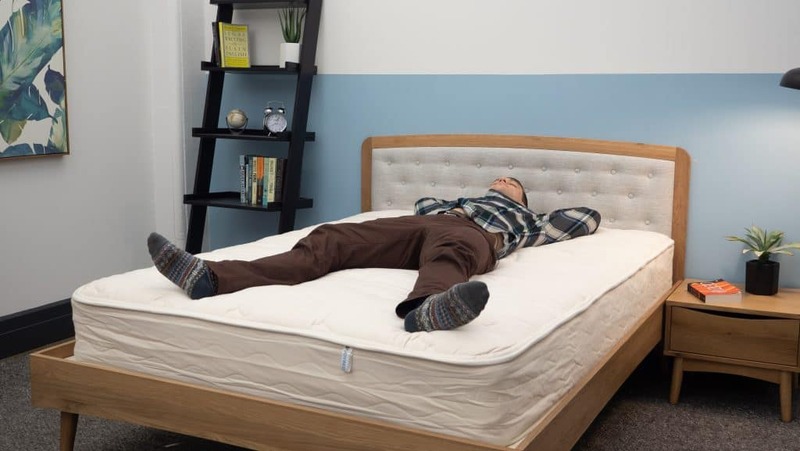 While this feel isn’t likely to please the strict side sleepers in the crowd, it could be a real winner for stomach sleepers, who typically need a firm mattress with plenty of support through the hips. Where softer beds tend to sink too much under the lower body and throw the spine out of alignment, a firmer mattress like this one keeps stomach sleepers lifted, ensuring good posture through the night. Firmer mattresses have a tendency to create pressure points, little spots of tension where the mattress pushes back against the body. Some pressure is necessary, but too much pressure can cause problems in the long run. It’s always a smart idea to check out the way a new mattress responds to pressure and body weight. To give you a better sense of how this mattress responds, I thought it might help to get a visual representation of pressure. To do this, I placed a pressure map on top of the mattress and lied on my back, side, and stomach. You can see the results on the image below where pressure appears on a color scale ranging from blue (for low pressure) to red (for high pressure). Back – Lying still on my back, I felt my whole body was lifted and well supported, with minimal sinkage and contouring. 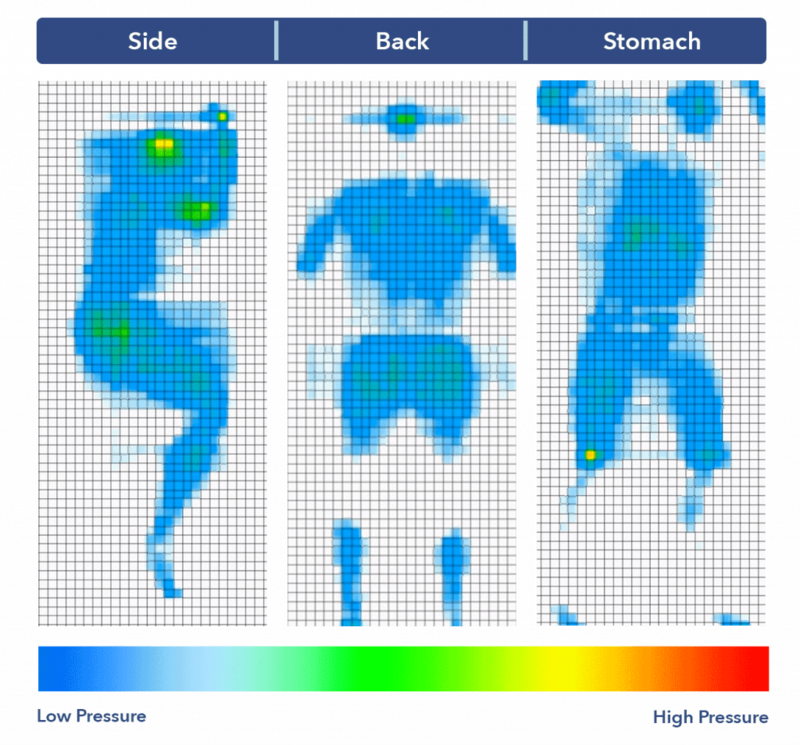 The pressure map above shows solid blue across the body, indicating very low pressure and even weight distribution across the mattress. I felt very much that I was lying “on top” of the bed, rather than “in” it. Side – Rolling onto my side was a breeze, and the bed’s bouncy texture made for easy range of motion. Once I was lying still on my side, however, I started to feel pressure in the hips and shoulders, where the support of the coils and the firm comfort layer resisted my body weight. Green and yellow colors on the pressure map here indicate potential problem spots for side sleepers, who will likely want a softer mattress to cushion those pressure points. 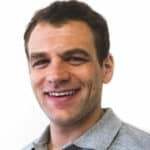 Stomach – Diving onto my stomach, I felt supported and lifted across the body, as well as some firmness through the midsection. I noticed my weight was evenly distributed in this position, with no feeling of sinking in at the hips. I did feel my knees dip into the mattress a bit, but this sinkage was nothing out of the ordinary. This bed’s bouncy support could be ideal for stomach sleepers, who usually need a bed with decent support at the hips to keep their spine from falling out of alignment. Love to snooze on your stomach? Be sure to check out our guide to the very best mattresses for stomach sleepers. Motion transfer is a measure of how movement travels across a mattress. It’s useful to anyone looking to buy a new bed, but it’s especially useful to those of you who share a bed with a partner. If you’re a light sleeper and your partner goes to bed after you, for instance, or if you’ve got a Bernese Mountain Dog who loves to sleep at your feet, motion transfer is a key feature you’ll want to explore. To illustrate motion transfer in this Joybed mattress, I dropped a 5 kg steel ball from heights of 4 inches, 8 inches and 12 inches and measured the disturbance it caused. The graph below should be pretty straightforward: the bigger the lines, the bigger the disturbance. 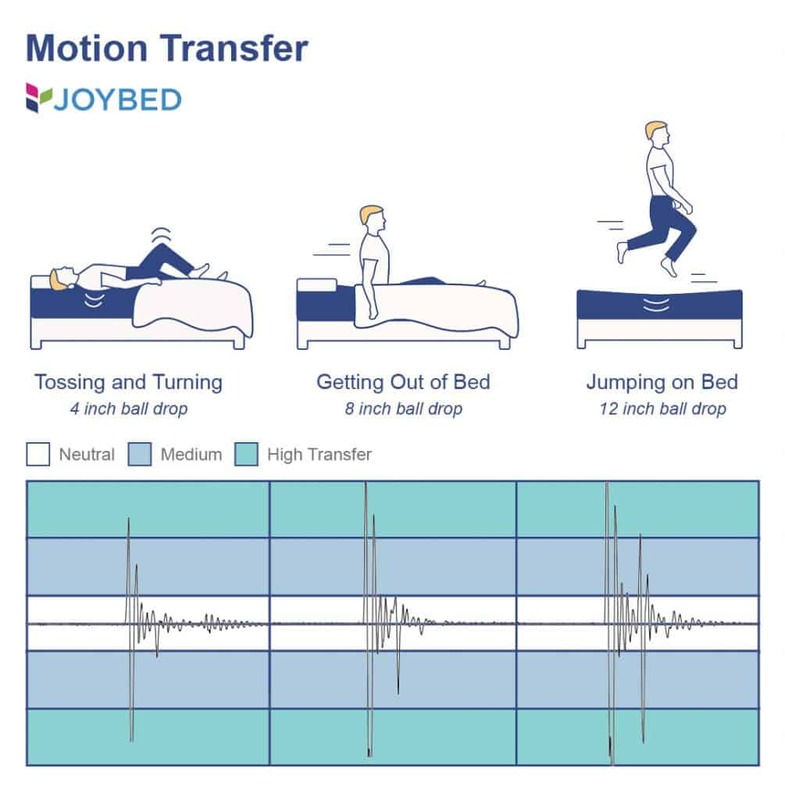 These motion transfer results show that the Joybed mattress has high motion transfer, which makes sense given the bed’s construction: coils lend bounce, the comfort layer is relatively thin, and there’s no foam to help absorb shock. Great news for people who love bounce, but bad news for restless sleepers: those large spikes of disturbance in the graph mean you’re probably going to feel it when your partner climbs into bed. If you’ve ever stretched out on a new bed and felt smothered by foam, then you know firsthand the deleterious effects of too much sinkage. Sinkage is a critical aspect of a bed’s overall feel, as it determines whether you feel like you’re sleeping “on top” of the mattress or “in” it. 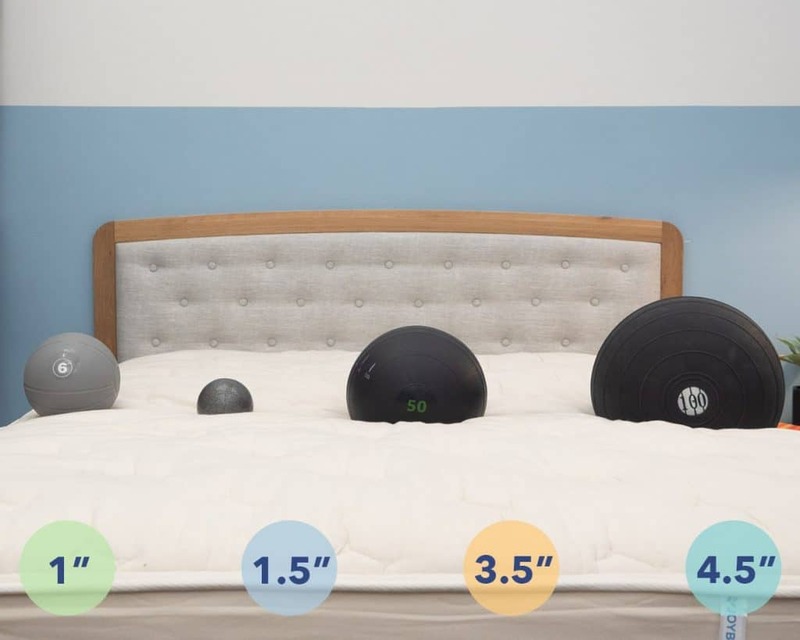 To demonstrate the sinkage of this Joybed mattress, I placed four balls of different sizes and densities (a 6 lb medicine ball, a 10 lb steel ball, a 50 lb medicine ball, and a 100 lb medicine ball) on the bed and measured how much they compressed the surface. These results show some of the lowest sinkage numbers I’ve seen in all my time testing mattresses. Results from the 50 lb and 100 lb medicine balls were especially striking, with numbers at least a full inch above the typical sinkage range. These results illuminate the minimal sinkage of the bed’s natural materials, and speak to the its general firmness and feel. With sinkage like this, you’re going to feel a lot more like you’re sleeping “on” this bed, rather than “in” it, which is great for firmness fanatics and stomach sleepers. But if you’re the kind of sleeper who loves a super soft, sinkable sleep experience, the Joybed mattress is probably not the bed for you. IS THE JOYBED MATTRESS RIGHT FOR YOU? Now that we’ve taken a close look at how the Joybed feels and functions, I’ll go ahead and walk you through some general recommendations and complaints about this bed. In short, here are a few reasons this bed might be nature-made for you, along with a few reasons it could be a natural disaster. Stomach sleepers – As I mentioned throughout the review, this mattress is firm, with a lot of bounce and support. Bounce comes in handy with stomach sleepers, as it helps lift the lower body, support the hips, and keep the spine in healthy alignment. Minimal sinkage only makes the mattress more appealing to those who love lounging stomach-side. Firmness fans – If firmness is your favorite, this bed might be your golden ticket. Foams are designed specifically to be softer and more luxurious than natural materials, even though they’re not so cool and breathable as cotton. Fans of firm beds with tons of bounce and strong support may love this mattress. Not great for side sleepers – If you love to snooze on your side, the Joybed mattress is probably not the best option for you. The bed’s firm and supportive comfort layer does little to cradle the hips and shoulders, which means side sleepers are likely to feel tension and misalignment in the spine. High motion transfer – The Joybed’s bouncy nature, while perfect for firm support and breathability, also make it extremely sensitive to motion and movement. If you share a bed or tend to wake easily, this is probably not the bed for you. Shipping: Free and comes compressed in a box. Think the Joybed might be just the mattress you’ve been looking for? Take a peek at the size and pricing information for the mattress in the table below.